Source: The Profit Magazine, Aug – Nov 2014. When you drive up to Bostock’s Organic Free Range Chicken Farm it’s clear to see they’ve got the free range recipe right. Plump, white chickens surrounded by vineyards and green pastures, free to range at their leisure. This is the type of farming that is true to the pure, green NZ image and certainly gives you confidence about poultry farming. 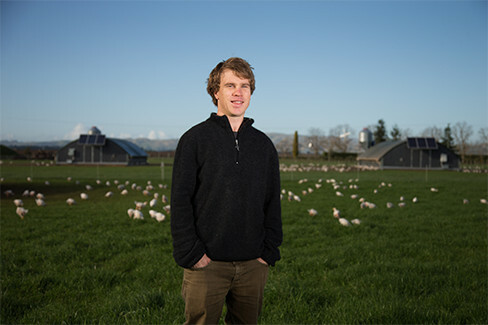 Hawke’s Bay is now home to one of the only organic free range chicken farms in the country with owner, Ben Bostock, keen to educate consumers about where their food comes from, producing a premium product that can be both financially and environmentally successful. “We are the real deal here, totally transparent. The difference between the organic standard and the free range standard is that we are about 30 times more free range than what you see under the normal free range birds in the supermarket.” “Our chickens are also antibiotic free, GMO free and chemical free. They live twice as long as any other meat eating chicken, which is a major point of difference to normal free range, which are still pumped with antibiotics.” Ben grew up on his family apple orchard near Hastings and is now adding a taste of protein to his family’s proud organic growing history by producing organic chicken. His father John Bostock is the pioneer of commercial organic apple production in New Zealand, so Ben has grown up with a passion for healthy, safe growing processes where there is control – which means no chemicals, no antibiotics, no hormones and no genetic modification. Welfare and quality are Ben’s key focuses. While working for a meat export company in Auckland, Ben saw how far removed the sheep and beef farmers were from their markets. He saw an opportunity to produce a product where he controlled the whole process from the pasture to the plate – where he could grow the food, grow the chickens and distribute them to market. “I’m really into the idea of being vertically integrated. We can grow our own grain, mill the grain, feed the chicken, pack the chickens and market them under our own brand and control the whole operation.” Ben had the perfect environment to grow organic chickens. There was no better location than his organic family orchard in Hawke’s Bay to make his dream a reality and so the journey began! Ben established Bostock’s Organic Free Range Chicken in June but it had been a year in the making. “I’m really into the idea of being vertically integrated. We can grow our own grain, mill the grain, feed the chicken, pack the chickens and market them under our own brand and control the whole operation – Ben Bostock”. “My organic chicken farm has taken about a year to set up. From getting the sheds arranged, importing them from France, the crop grown and the processing plants set up.” Ben researched international poultry practices, which included trips to France to see how he could produce some of the best free range organic chicken in the world. The French take their chicken and their freedom very seriously. Superior tasting, succulent chickens are part of French culture and identity. 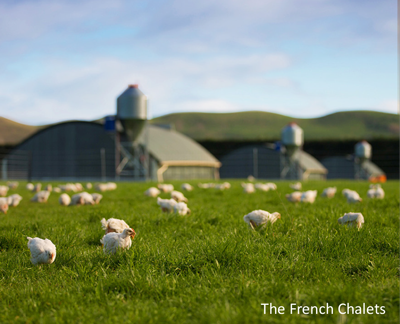 Ben wanted to produce the same premium poultry in New Zealand and give the Kiwi consumer an unforgettable experience. The key to the French success is nurturing, feeding and raising chickens well. Determined to give his organic chickens the best life, Ben purchased some ‘French Chalets’, which are state of the art, clean, spacious and solar powered. They have a solar operated feeding system and windows, which enable the chickens to roam freely outside once they’re fully feathered. The chalets are also mobile and can be moved regularly to ensure the flocks have fresh grass all year around. “We grow our own feed, including corn and barley, which ensures we are controlling the entire process. “These days more consumers want to know that they are buying healthy, pure meat, which has been raised well,” Ben says. However, the challenge for Ben is educating consumers and marketing his organic chicken products well from the outset. “We aren’t producing for the masses like the other companies. We are small scale and produce a niche product focusing on quality as opposed to quantity. The Tegel and Ingham plants can process up to 100,000 chickens a day. 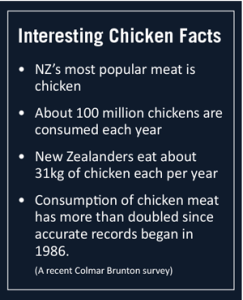 Whereas we are processing about 300 a day – 80,000 per year.” Ben says all chicken meat producers in New Zealand buy their birds for the same price – one dollar each. “We start off on the same playing field but the difference in the price we retail our chickens for is the cost in rearing them. Our chickens cost more to bring to the market because they live twice as long and we feed them twice as much. But we believe in quality and giving our chickens a good life, which translates onto the plate for the consumer.” The first few months have been busy up-skilling staff, which has included teaching them how to handle the chickens with ‘kindness’. Ben himself has been focused on marketing his products to retailers and is fielding strong inquiry from across the country. It’s still early days for Ben, but he is on a mission to get his chicken business booming and believes the increase in demand for more sustainable farming practices will help drive success.